Finally after months of editing and faffing I again pressed the Lulu – ‘go ahead’ button and the third in my trilogy was formed and pressed into book shape. Behold, said Lulu, now you can really get down to some serious faffing . . . four edit copies later I couldn’t stand it anymore and signaled ‘that’ll do’ to myself and anyone listening in the house — dogs, I expect. So it arrived, copy five and despite spotting a missing ‘to’ somewhere, so far it seems . . . alright. Well, people have read it and said it’s more than alright, so calmness pervades until the next editing task: Hoxton. Mad Dog Café is out on Amazon along with the other two books. No 1 available on kindle and other readers, 2 and 3 to follow shortly. 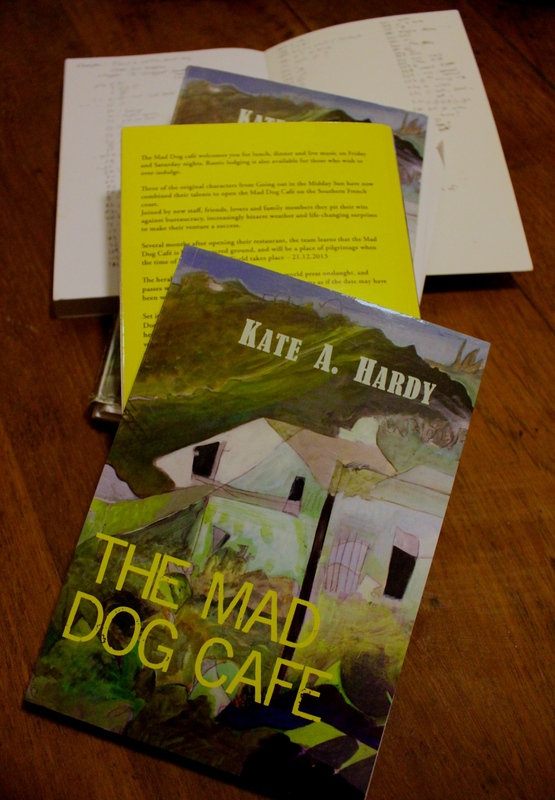 An extract from The Mad Dog Café. Jasper wandered back outside and looked at the swaying palm trees. He must have appeared close to breaking point as someone standing next to him chose to ask him as much. Jasper turned to see a young dreadlocked man, gazing at him with large brown eyes, almost black; the dilated pupils telling of a happy drug- induced state. “I’ve really no idea,” replied Jasper, truthfully. Christ, no, but . . . “Yes, sure . . . but will there be a room?” Jasper waved a hand at the hapless crowds. Heaving an ex-army knapsack onto his back, the guy swayed off to the taxi rank. The third taxi reluctantly stopped in front of them. The owner pinged the boot lid and gestured for them to put their luggage in it, staying firmly put in his seat. “Watch the upholstery,” he growled, as they got in the car. “Relax, I’m house-trained, man,” grinned Jasper’s new friend, “Silver Palace Motel, downtown.” The taxi driver nodded knowingly and they sped away. In a perfect world, Jasper would have been brought a ladder and some paint. He would have rested the ladder against the Motel’s sign, climbed up and re-written it for them: ‘Fetid Hole Motel’, or something similar, but then in a perfect world he would be at home in bed with Darren. Sighing, he contributed to the taxi fare and contemplated the exterior of the building under the dim light of the one street lamp. It was possibly the most vile place he had ever stayed in, or was about to stay in. Sandwiched between a fruit wholesalers and a place strewn with parts of trucks, the building seemed to be in a state of collapse at one end. “Well, I was hoping you might have a spare room?” Jasper asked, suddenly feeling terribly English, square and law-abiding. “Meet you for a beer in the courtyard, ten minutes?” called Jasper’s friend as he disappeared down an unlit corridor. Jasper headed off in the direction indicated and thought about the word courtyard: a small marble square, the peaceful sound of water from a fountain, doves, climbing plants? Probably not. The word sleazy suddenly had a whole new list of meanings attached to it as Jasper opened the door to his room. A million cigarettes must have been sucked into lungs; a thousand desperate fucks against the worn headboard, extra-marital, illicit, illegal and far, far worse. He put his case down and sat on the bed, which sagged alarmingly. Yes a beer was imperative — many and sod the consequences. The courtyard might have once been quite attractive in the early 70s; now it was a dusty concrete space filled with scabby tables and chairs. The pool was empty with a sign chain-linked across the metal handrail of the steps: closed for refurbishment. A few semi-dead plants pleaded for water. Jasper sat down and waited for his companion. He arrived, now dressed in shorts and a T-shirt with the letters: Don’t piss with me. Death is only a bullet away, emblazoned in friendly orange letters on the front. Jasper nodded and thought of sitting with Peter at a nice, calm piano concert in Perpignan. God he was so homesick. The sweating owner appeared: “Beer?” and disappeared again at the nod of the dreadlocked head. “Bird,” said Jasper’s friend and held out a hand. Bird was busy rolling an impossibly large joint. He finished it triumphantly with a twist of the white, fragile paper; applied a lighter to the end and drew hard, eyes closed, brow furrowed. “What’s funny, man?” smiled Bird, sleepily.